When growing plants indoors it is often difficult to provide the proper amount of light required to maintain a happy and healthy specimen. With the onset of winter, the days are shorter and the nights are longer limiting the amount of available natural sunlight even further. The intensity of the sun is also diminished at this time of year. The addition of artificial lighting to replace or supplement natural sunlight is important for growing healthy, attractive houseplants and necessary to keep flowering plants in bloom during the winter months. In order for a plant to grow properly the light it receives must mimic natural sunlight. Sunlight contains all the colors of the spectrum and all are necessary for the process of photosynthesis. Red and blue are two of the most important colors vital to plant growth. Red stimulates vegetative growth and flowering, however, too much red will create a leggy, stretched plant. Blue regulates plant growth for a fuller, stockier plant. For the best results, choose a full-spectrum fluorescent gro-bulb. 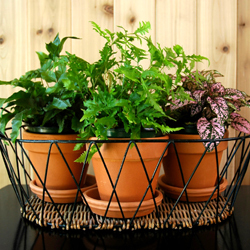 This is the best lighting choice for optimum houseplant health and vitality. Different types of plants require different light intensities. Some plants thrive in low light, others require bright light. With artificial lighting the intensity of light is determined by the bulb wattage and how close the plant is to the light source. Knowing the light requirements of your plants will benefit you greatly when determining where to place a light and which plants to group together under the fixture. 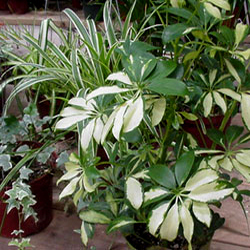 As a general rule of thumb, plants that are grown for fruit and flower usually require more light than those grown strictly for their foliage. Plants under artificial light should be rotated weekly, as light from tube style bulbs is more intense in the center of the bulb than at the ends. Using white trays, mirrors or trays lined with foil will help reflect light to increase the amount of light available to your plants. 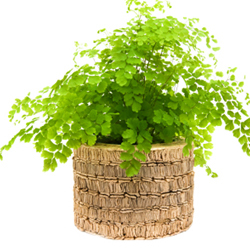 Most houseplants do well with 12-16 hours of artificial fluorescent light each day. Too little light will result in elongated, spindly growth and too much light will cause a plant to wilt, color to fade, soil to become excessively dry and foliage to burn. Plants also require a rest period each day. Providing your plants with an 8-12 hour period of darkness a day will moderate plant growth rate and provide the rest necessary for setting flower buds. For example, the Christmas cactus needs 13 hours of uninterrupted darkness a day, for six weeks, in order to set flower buds. Without this required time of rest time the Christmas cactus will not flower. The use of an automatic timer is helpful in regulating the amount of time your houseplants are exposed to light and darkness. When choosing a plant light fixture, the most important feature is that the fixture be adjustable. You should be able to adjust the fixture up and down to account for the growth height and varied light intensity requirements of a variety of plants. If the fixture is not adjustable you will limit the type of plants that you can grow and how much you can use the fixture. Simple shop lights and tabletop light fixtures are both adjustable and good choices for lighting houseplants. Another consideration is the size of the fixture. Size choice is based on the number of plants that you plan to grow under the light. Lighted plant carts provide multi levels of lighted shelves on which to grow plants. Carts are on wheels that make them easy to relocate, while tabletop fixtures are lightweight and easily transported to other locations when necessary. It may seem intimidating to get started with artificial light sources, but you will be amazed at the difference it will make to all your indoor plants, houseplants and seedlings alike.